Easily cross-reference which medical conditions each LTC insurance carrier accepts or declines. Find underwriting manuals, risk notes, and more for quick downloading. Look up medicines and diseases in our underwriting databases. Download carrier application forms and other materials to make underwriting easier and faster. Underwriting for long term care insurance is continually evolving as carriers adapt to the ever-changing conditions of the industry. Keeping in pace with the processes, practices, and requirements of each insurance company is tough even for top agents, but ultimately necessary to continue achieving results. 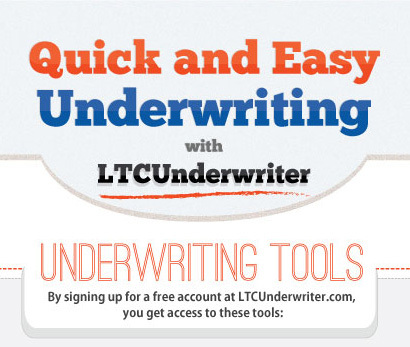 LTCUnderwriter.com is a free, comprehensive resource for all your LTC insurance underwriting needs. Through the site’s regularly-updated databases, you can easily access tools, manuals, forms, and references. This will make the underwriting process smoother and easier, so you can focus on giving the best service to your clients. Check out our short infographic about how LTCUnderwriter.com's tools and features will make your insurance underwriting tasks easier and faster. LTCUnderwriter.com is meant for the use of licensed professionals only and not for the use of consumers. While LTCUnderwriter.com strives to keep the information on the site accurate, all data should still be verified by agents.